Guido de Columnis wrote his version of the Trojan story as early as the 13th century and its popularity is attested to by the number of translations which exist. 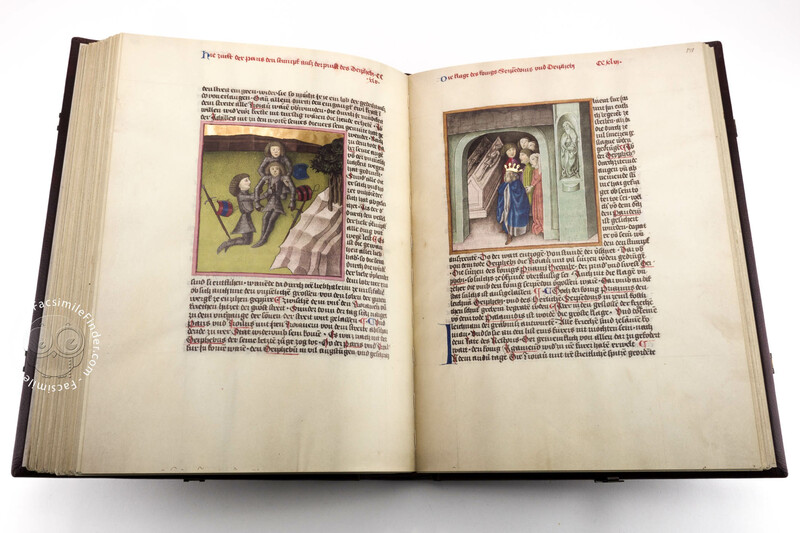 This manuscript, with its outstanding miniatures, was made in Regensburg in the 15th century and can also be understood as a handbook of life at the courts in the Middle Ages. Hardly any other ancient legend exudes, even today, the same fascination as the story of the downfall of Troy. The episodes of the abduction of Helen, wife of the King of Greece, by her lover Paris, the dramatic battles between the heroes Hector and Achilles, and not least the outwitting of the inhabitants of Troy by using the Trojan Horse are all part of our cultural identity. The legend of Troy, however, was particularly dear to the aristocratic world of the Middle Ages, when countless noble families invented Trojan ancestors, ascribing their own genealogy to different heroes of Troy. 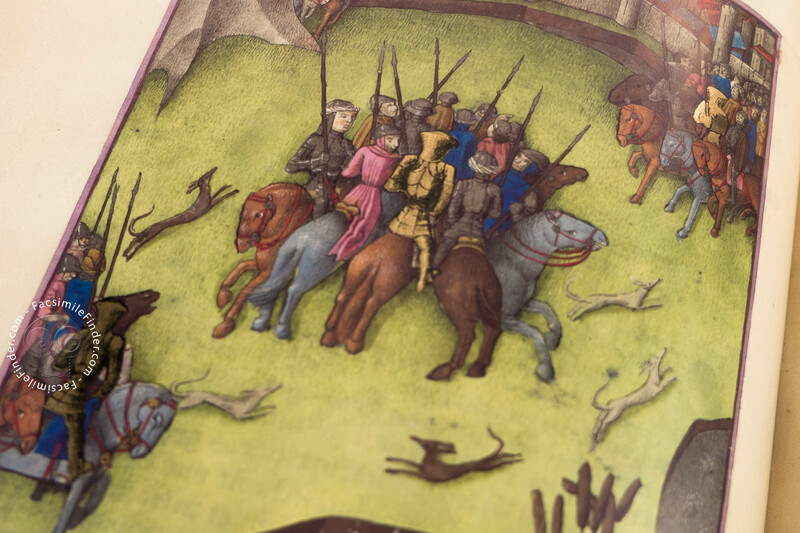 The popularity of the legend in the Middle Ages was thus less based on Homer’s or Virgil’s epics anchored in the world of pagan deities than on alleged eye-witness reports that pretended to reproduce the events on the battle-fields in all detail. This was also the source for the Sicilian Guido de Columnis whose Historia destructionis Troiae achieved incredible fame in the 13th century and was translated into numerous languages. Vol. 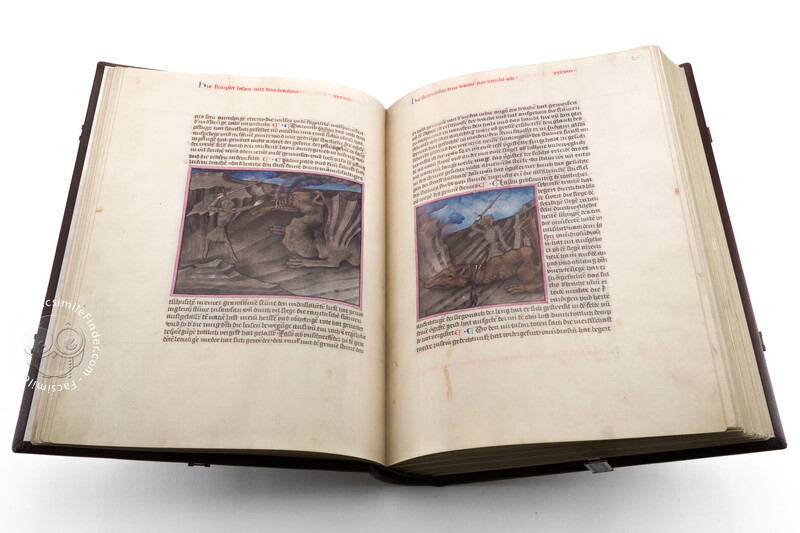 2773 in the Austrian National Library presents one of the most unusual Troy manuscripts dating from the late Middle Ages: although a word-for-word translation of Guido’s Romance of Troy, the volume is above all intended as a picture book. Its 334 miniatures on 478 pages in the format 27.5 x 37.0 cm comprise the most extensive Troy Cycle of the German-speaking world and enable the user to experience the entire heroic tale, from the Legend of the Argonauts to the tragic death of Ulysses. 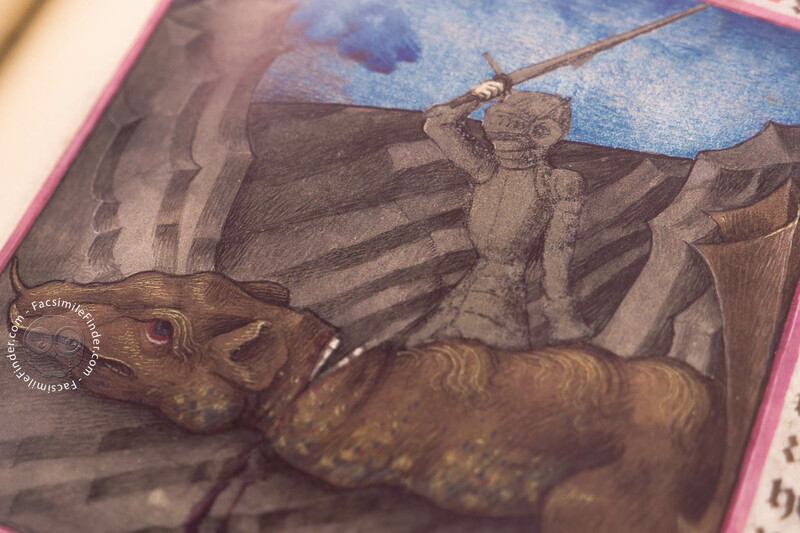 The initial makers spared no expense in producing the manuscript. 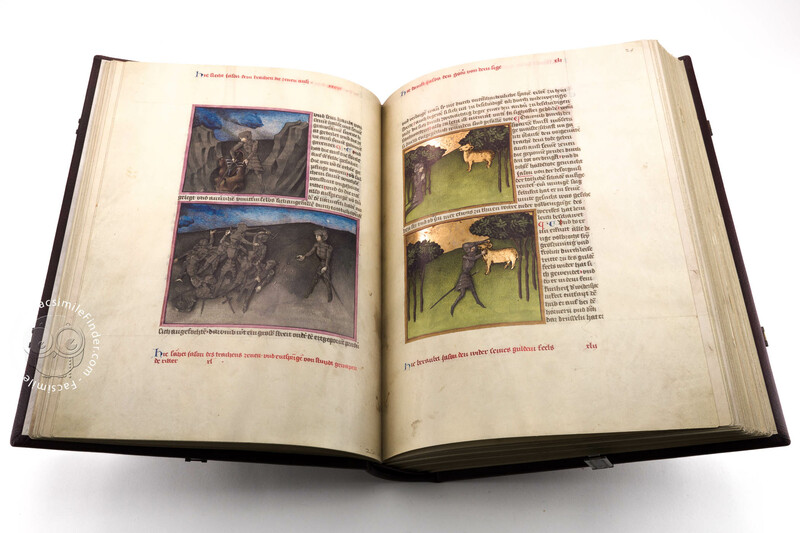 The translation was done especially for this purpose, the text written down in textura, a highly representative book hand. 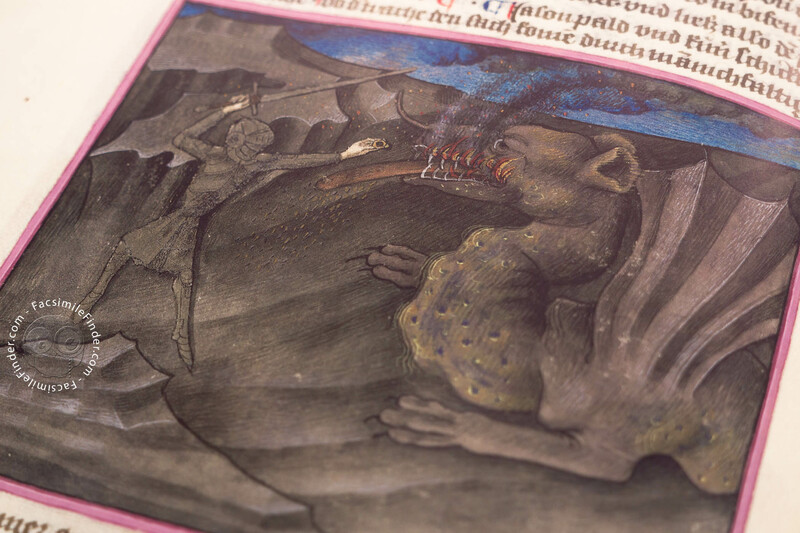 The special charm of this manuscript is not least due to its enchanting miniatures. 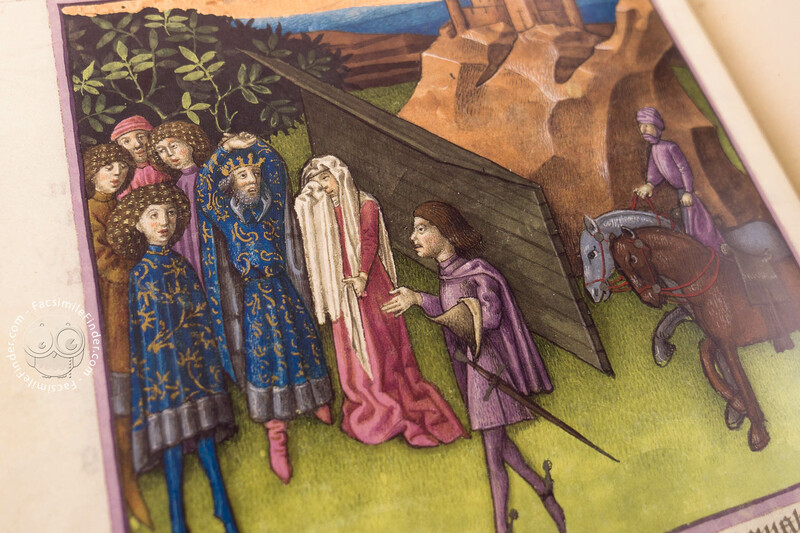 The Romance of Troy may be considered as a handbook for the courtly world of the Middle Ages. 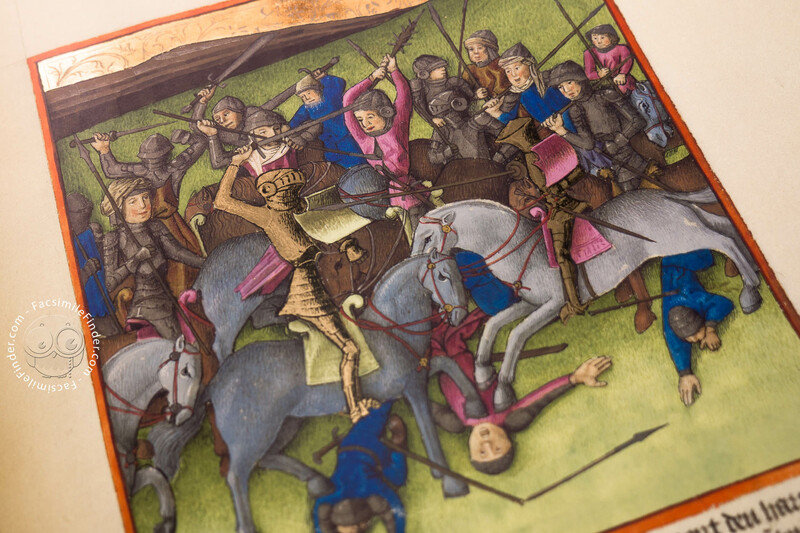 In addition to the battle scenes which, in spite of their drastic bluntness, rather convey a romantically transfigured image of medieval fighting, the manuscript is above all intended as the presentation of a courtly society, its universe, customs and rituals, thus making the book an outstanding source of information about medieval court ceremonial. 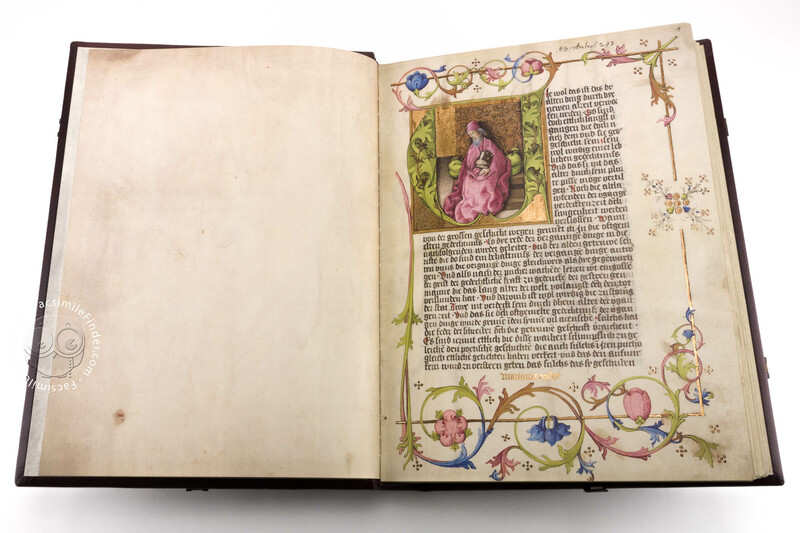 Written in golden letters, the words Martinus Opifex (Martin, creator of this work) on the first page of the volume bear testimony to the proud illuminator who painted it – we know of no other similar example! 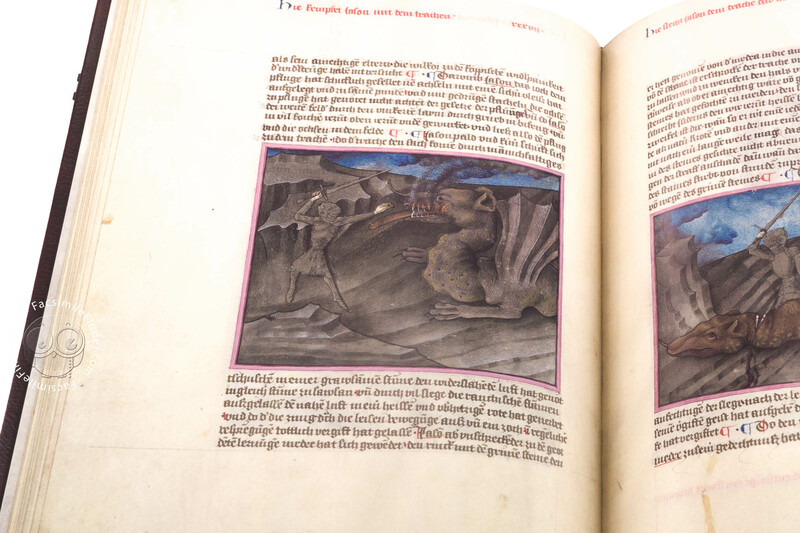 Lucky circumstances allow us to identify him as the illuminator Martin evidenced in Regensburg from 1432 to 1456. 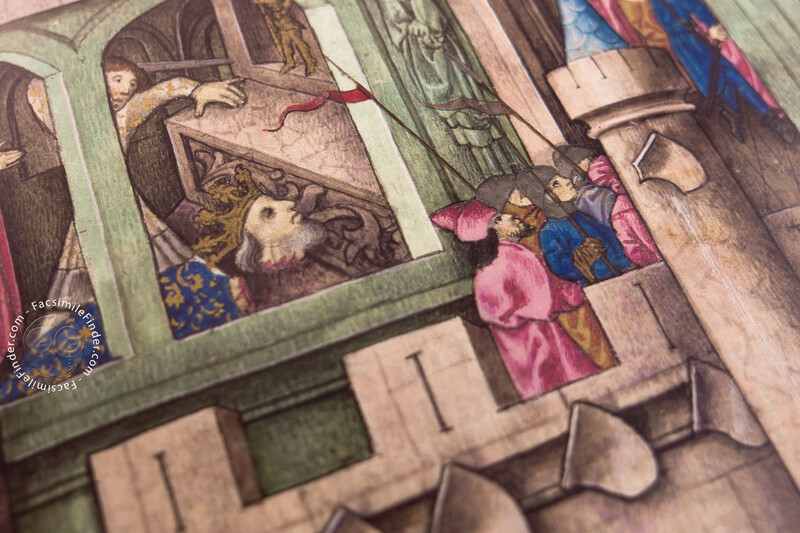 It is certainly no coincidence that this gifted artist was active there, since the old Royal Palace of Regensburg was among the most prominent centres of medieval illumination. 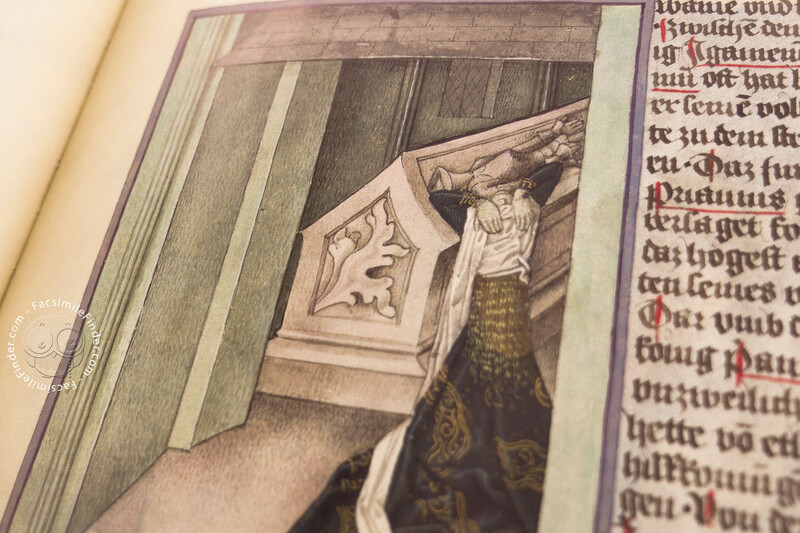 Its workshops produced true masterpieces, such as the monumental Ottheinrich Bible. 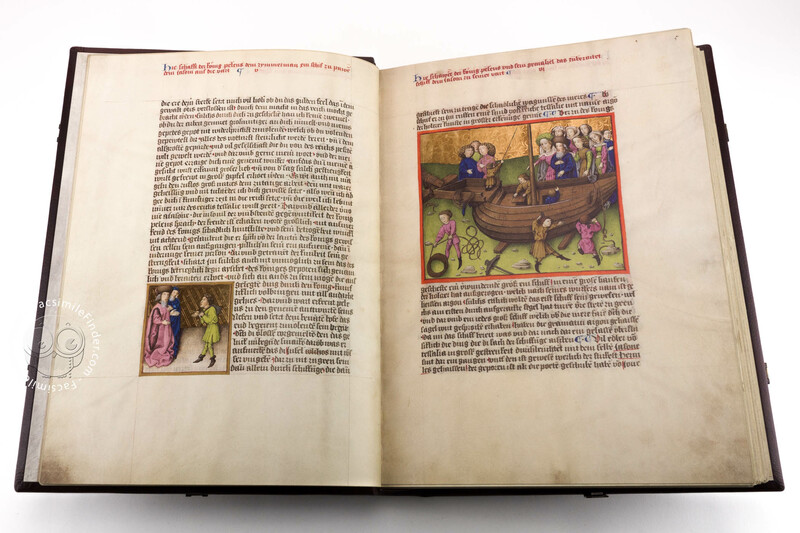 Martin’s individual and highly distinctive style allows us to attribute further manuscripts to his hand. 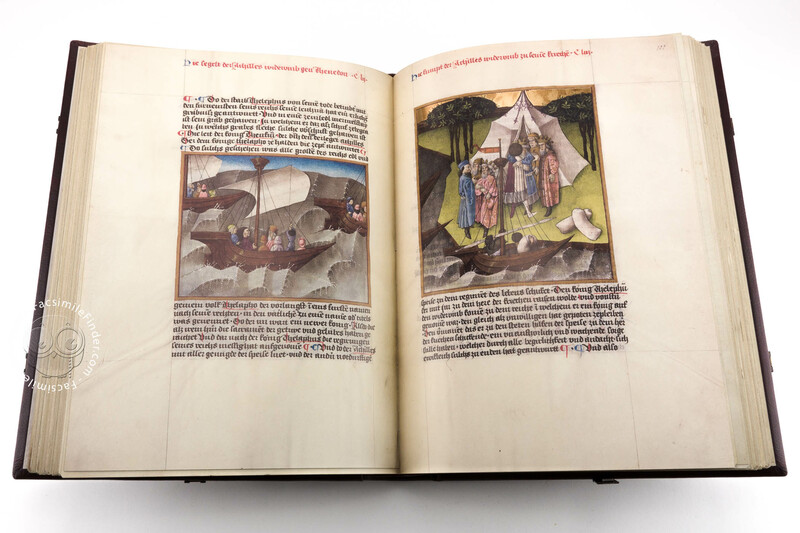 The artist was highly respected by his contemporaries; he played a leading role at the Court of Vienna in the 1440s and took part in the illumination of two volumes for the king of Germany and later Emperor Frederick III. 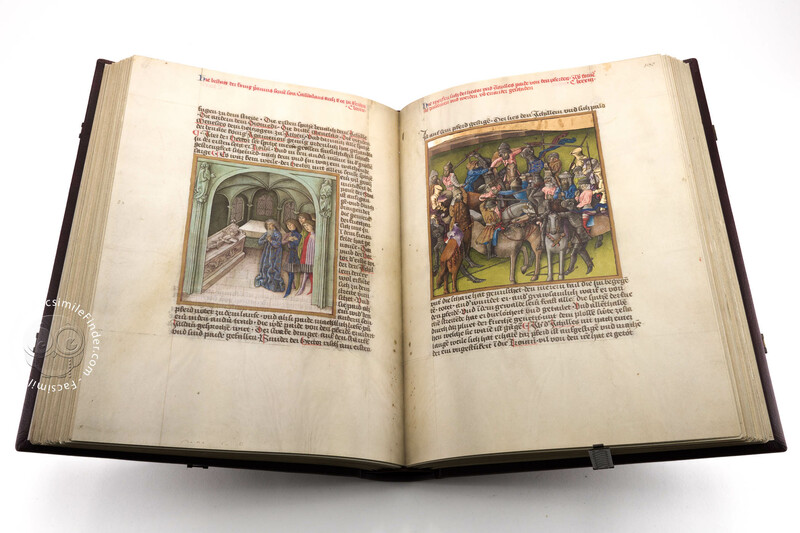 Despite its outstanding decoration and prestigious character, the manuscript contains no indication of its initial destination. 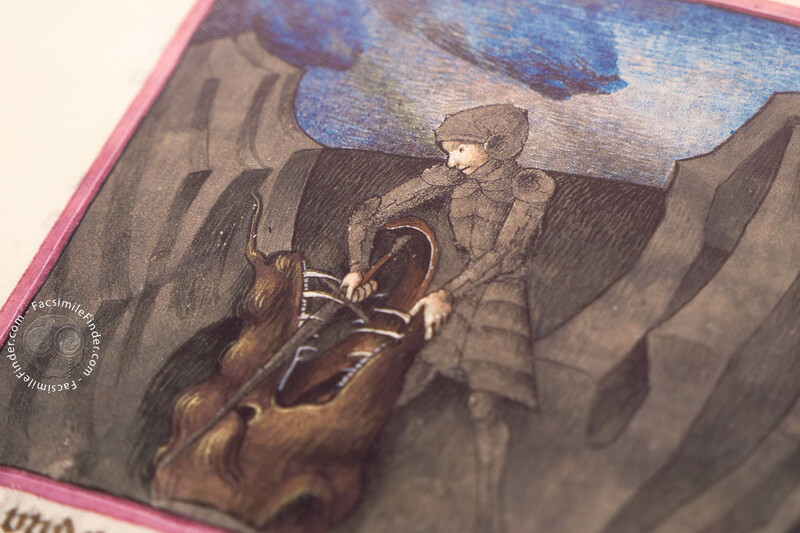 The book originally remained with the artist himself. 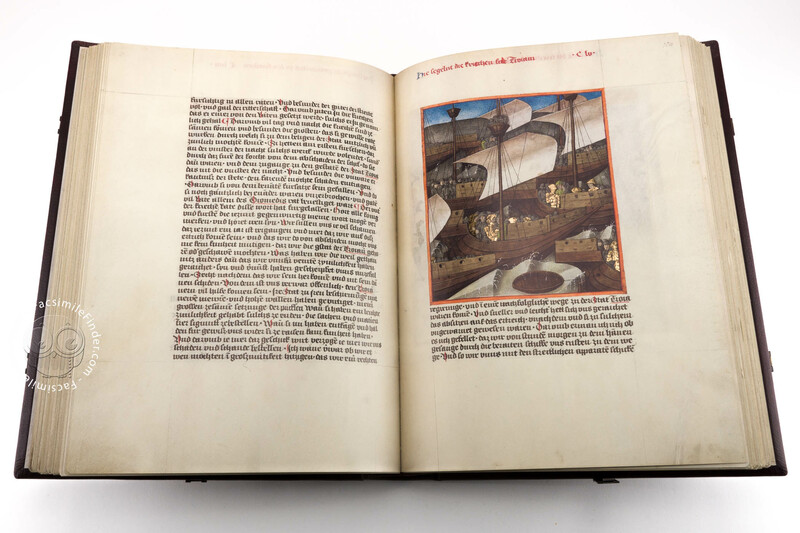 His widow sold it in 1456 to the Council of Regensburg City, for the handsome amount of approx. 30 pounds of silver, converted to our standards. 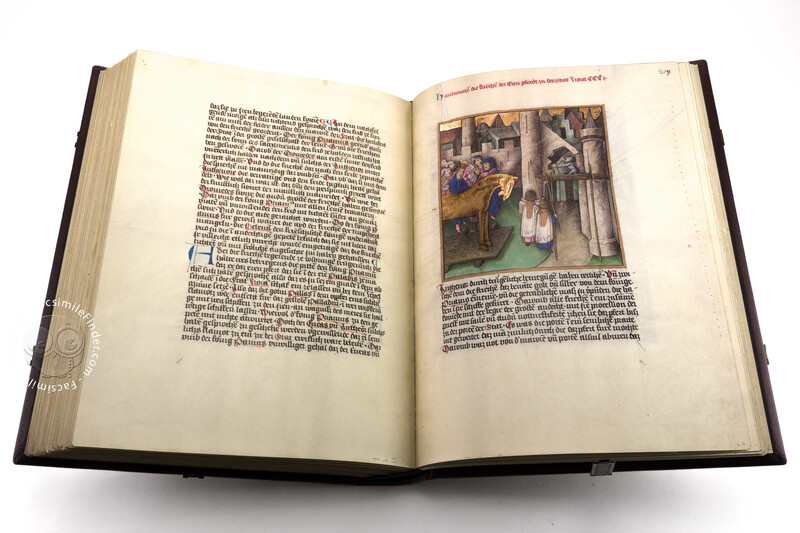 The volume then went to Vienna, as a gift to the Imperial Chancellor, and later entered the possessions of the Habsburg dynasty: Emperor Maximilian I was one of its owners. 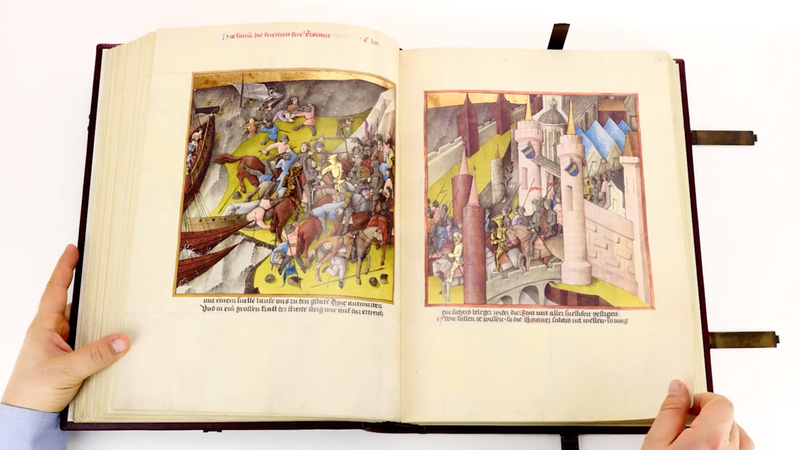 From c. 1574 onwards, the Viennese Romance of Troy was kept at Ambras Castle in Tyrol, as part of the library of Ferdinand II, from where it was transferred back to Vienna, together with most of the Ambras collection. 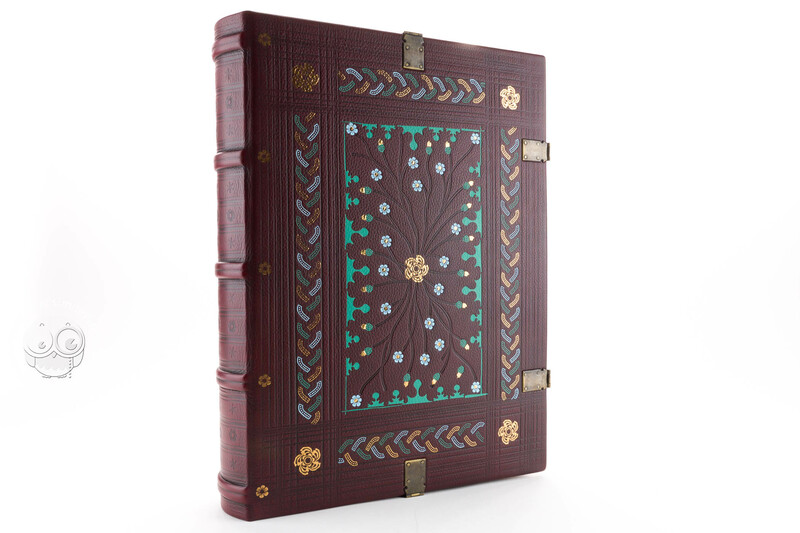 Apart from the binding, that was restored in 1951, the entire volume has survived and is in excellent condition. Manuscript book on parchment − 37 × 27.5 cm − 478 pp. 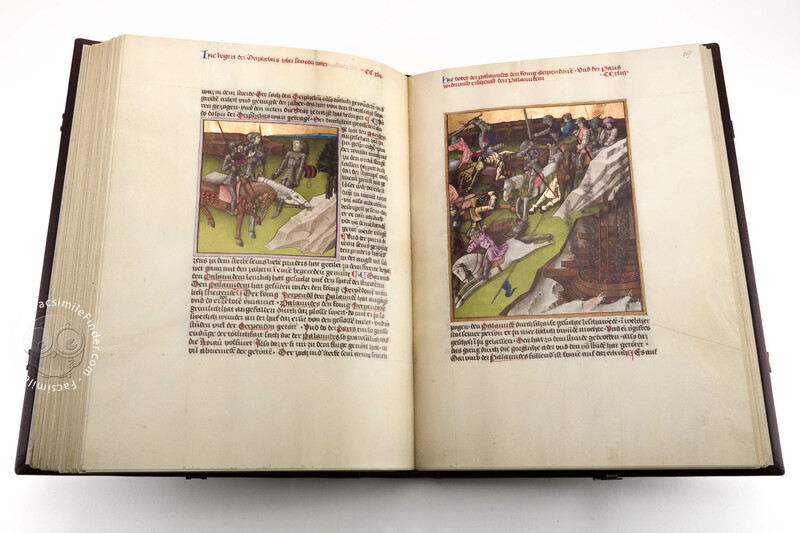 Guido de Columnis: Der Trojanische Krieg facsimile edition by Faksimile Verlag. 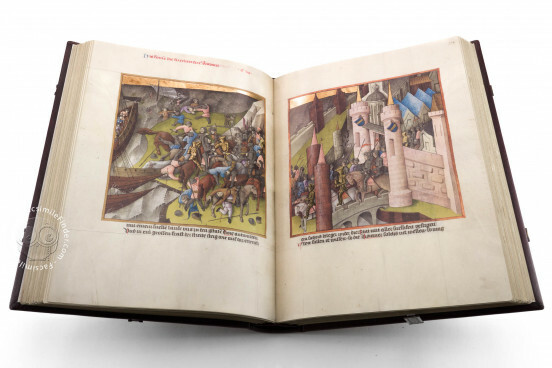 Full-size color reproduction of the entire original document, Guido de Columnis - The Trojan War: the facsimile attempts to replicate the look-and-feel and physical features of the original document; pages are trimmed according to the original format; the binding might not be consistent with the current document binding. 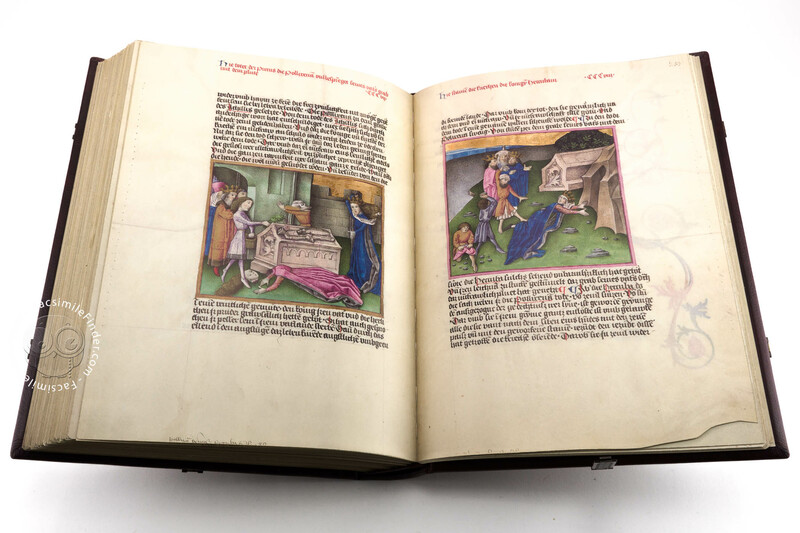 The facsimile and commentary volume come in a joint case with acrylic cover. 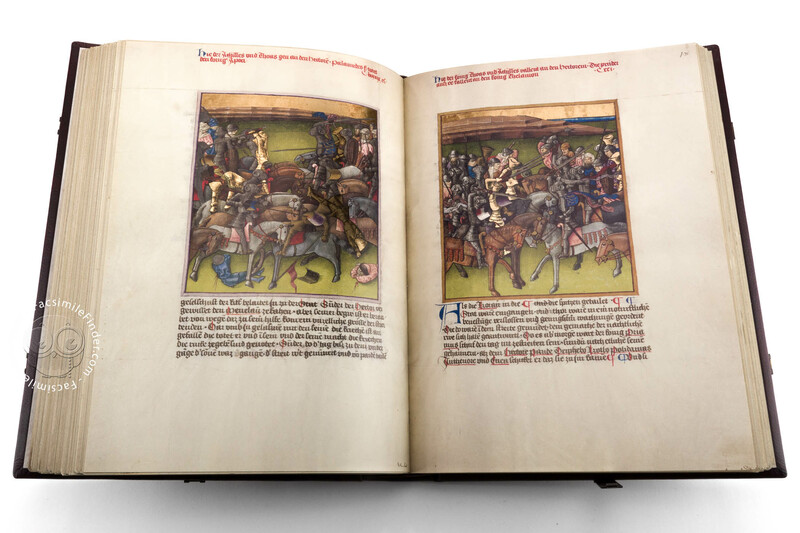 The commentary provides the first-ever detailed scholarly discussion of the manuscript. 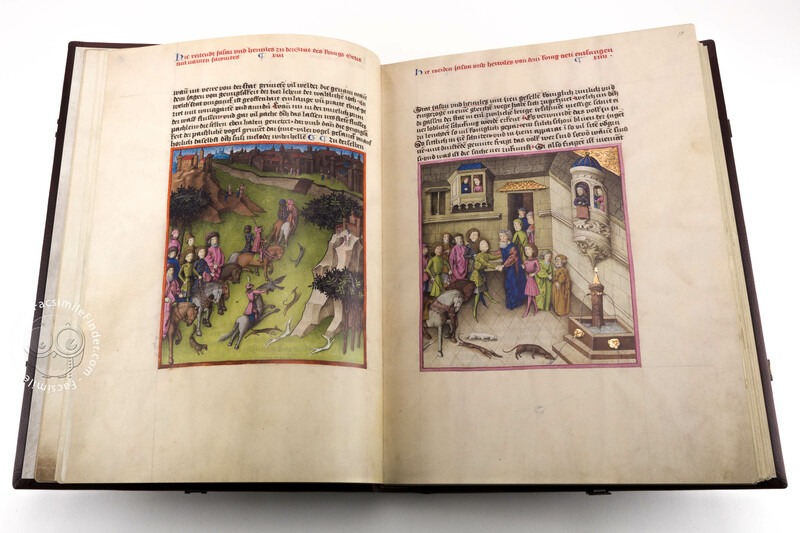 The binding of the facsimile edition has been modelled on the binding of a late medieval calendar manuscript dating from 1481, now in the Österreichische Nationalbibliothek, Cod. 2683 from the studio of Ulrich Schreier, a bookmaker in Salzburg. The leather binding has four clasps and is decorated with blind toolings (line tool and single stamp colored motifs). 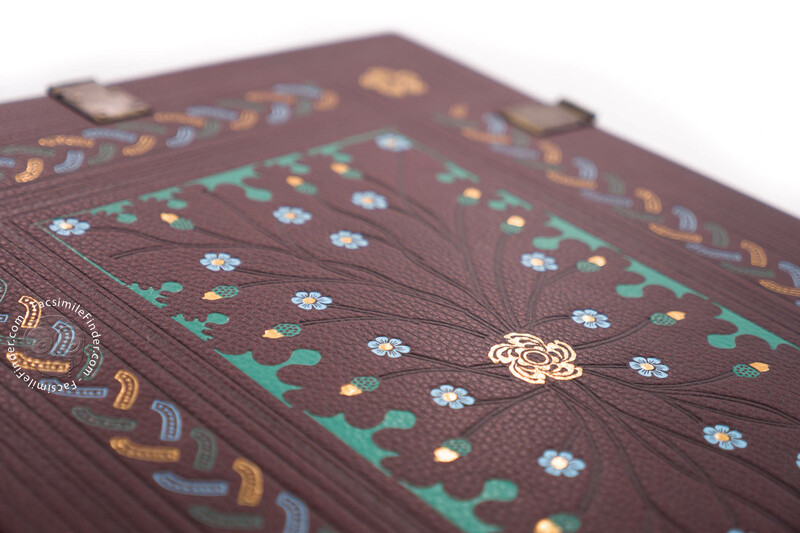 The corners of the frame and the centre of the book cover are each set with a whirl rosette in real gold. The book spine is made of five raised bands. 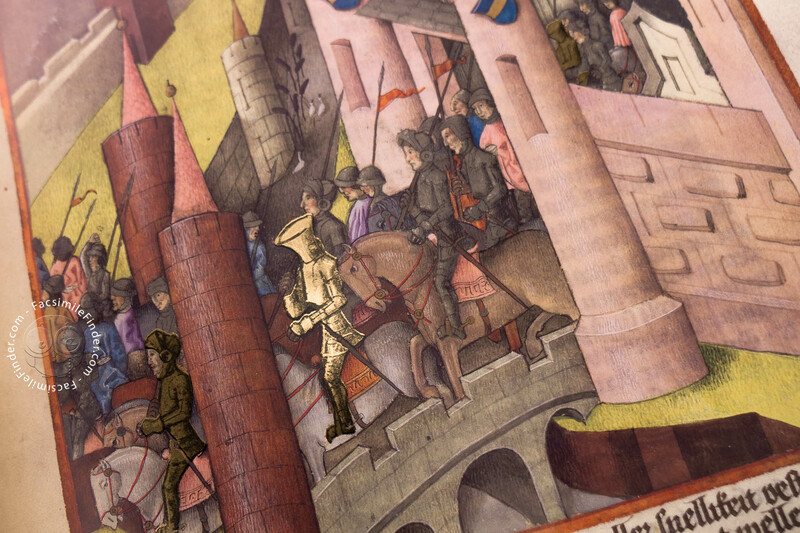 Guido de Columnis: Der Trojanische Krieg facsimile edition by Wissen Media Verlag GmbH. Published under the trademark Coron Exclusiv. 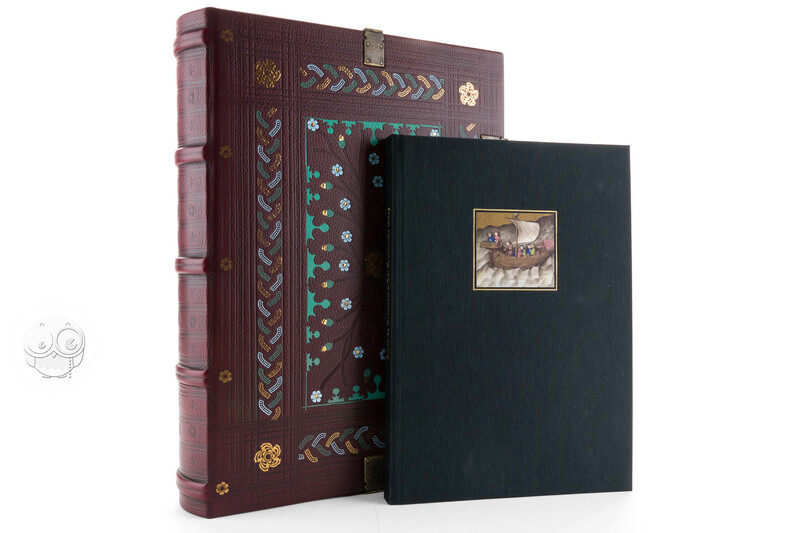 The facsimile and commentary volume come in a joint case with acrylic cover. 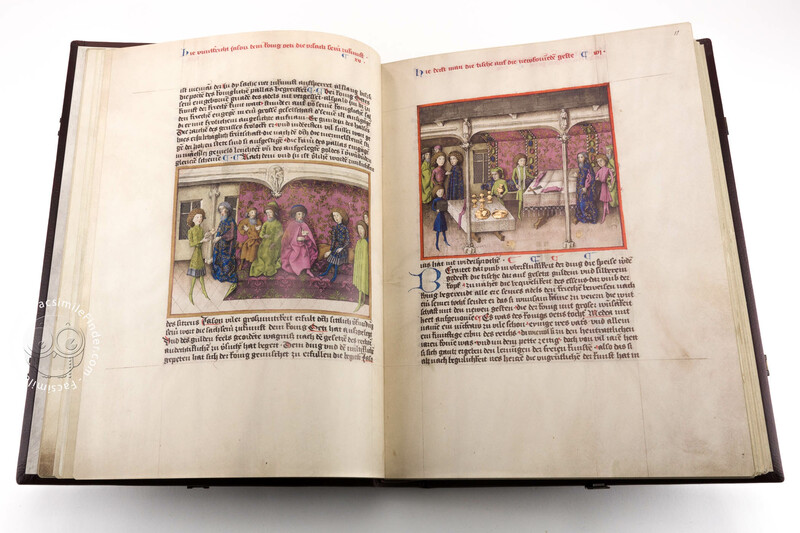 The commentary provides the first-ever detailed scholarly discussion of the manuscript.